I can hardly believe that the first part of the Games has come to an end! With some brilliant highs (Shawn Barber’s gold medal in pole vault comes to mind) and some disappointing lows (Gavin Smellie’s misstep in the men’s 4x100m relay) for Team Canada to call to memory, the wait begins for the final sporting events of the summer — the Parapan Am Games. But before we prepare for what’s to come, let’s rewind and take a look at how our #YorkU Lion athletes fared! 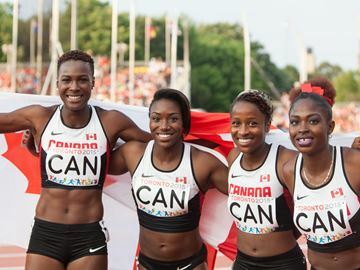 Khamica (second from the left) and her team after winning bronze in the women’s 4x100m relay. Image Source. After a rocky start, Khamica helped her women’s 4x100m relay team take home a bronze medal. Great work, Khamica! She also obtained a personal best Pan Am time of 11.13 in her final 100m race, in which she placed sixth. Look forward to seeing Khamica at the Beijing World Championships this August, where she will be representing Canada in 100m, 200m and the 4x100m relay. Katrina and her team during the final rhythmic gymnastics group event. Image Source. Katrina, the captain of the rhythmic gymnastics team, led the way to not one but two bronze medals in group hoops and ribbons. Congratulations to you and your team, fellow Lion! Now, Katrina and her team are already back to work, training and competing in Hungary, Russia and Bulgaria in preparation for the World Championships in Stuttgart, Germany. Those championships will determine the team’s eligibility to compete in the 2016 Rio Olympics. Melissa and her partner Taylor Pischke hug it out after losing to Team Brazil in the women’s bronze medal beach volleyball game. Image source. After winning all three of their preliminary games, Melissa and her partner, Taylor, ended their beach volleyball reign with a fourth-place finish. We’ll hopefully be seeing more from this talented duo as they get back into tournaments after a well-deserved short break to attempt qualification for the 2016 Rio Olympics. Best of luck! 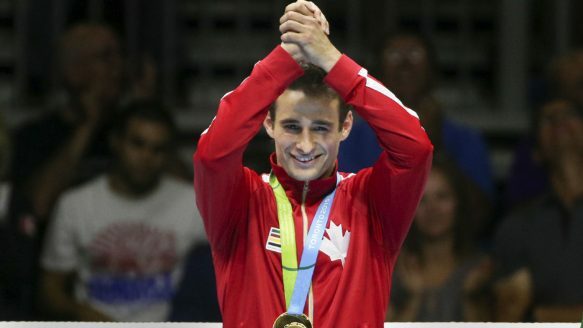 Arthur sporting a wide grin after winning gold and the junior welterweight title in men’s boxing. Image Source. After two perfect matches in the quarter-finals and semi-finals, Arthur proudly took the gold medal with a 2-1 score against Team Cuba’s Yasnier Toledo. He had set out with the determination to win the gold for Canada — and that he did! “I fought dirty, I fought hard and I fought all the way,” he said. I can’t wait to follow the boxing future of this talented York U Lion! Autumn (3rd from the right in the bottom row) and her team mates after their silver medal win against Team USA. Image Source. After winning all but one of their preliminary matches, Autumn and her team easily beat Team Venezuela in the bronze medal game before losing to Team USA 11-3 in the battle for gold. Congratulations on your silver! Dontae passes off the baton to team mate Brendon Rodney in the 4x100m relay semi-finals. Image Source. 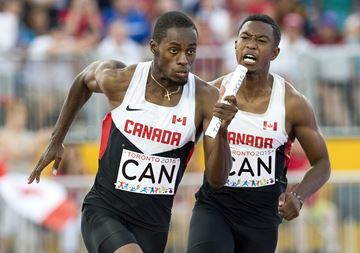 After placing third in the 4x100m relay semi-finals, Dontae enjoyed a short first-place win in the finals until his team was disqualified due to a small misstep by team member Gavin Smellie. Better luck next time! I know this won’t be the last we see of you. Dontae hopes to make the 2016 Rio Olympics, so best of luck to him. Kailah competing in the roller figure skating long program. Image Source. Kailah had a close fourth-place finish in both the short and the long programs for women’s roller figure skating. In the short program, she was only two points behind Team Chile’s Marisol Villarroel. During the long program she fared better, but still remained three points behind Team Chile. After her event she said, “This experience, medal or no medal, just being here and being able to represent Canada another time, was awesome.” What a great attitude! Stay tuned for more from our Lions and for coverage of the Parapan Am Games between August 7 and August 15. Want to talk about the Games? Make sure to comment below, or by tweeting me @yorkustudents.